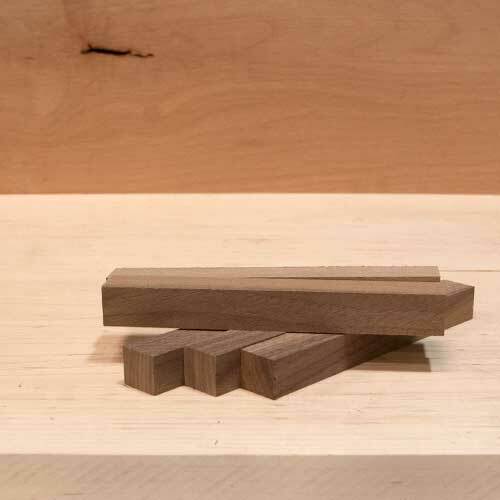 The Black Walnut Pen Blanks are easy to work and finish well. The color of the heartwood is greyish brown to dark chocolate. Sometimes it is purplish-black. The sapwood can be whitish to yellowish brown. The grain walnut is straight with a coarse texture. It stains and polishes to a high finish. * Carving and Turning Blanks maybe sawn up to +/- ¼” of size listed. These Black Walnut Pen Blanks are for turning on a lathe. They may not be exactly square and could vary a slight amount in length and width. If you have specific requirements please contact us. You can also place instructions in the order notes box at checkout.